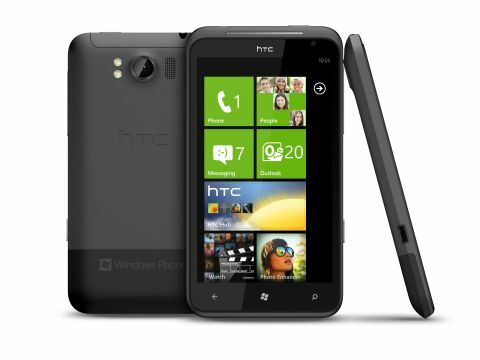 HTC was the first to roll out Windows Phone 7 devices when they launched in the UK last year. And, true to form, it's in the lead with Windows Phone 7.5 devices too. The HTC Titan is one of its two first Mango-powered handsets - the other being the Radar. HTC is doing fairly well right now. From the days of making (not so great) Windows Mobile handsets for networks, it's found its identity and is now riding high with a hugely recognisable brand around the world. Android was its saviour (and still is) but Windows hasn't been forgotten. So, what's in a name? Well, quite a lot actually. The Titans were giant beasts from ancient Greek mythology. So by giving the phone a name like this, HTC's certainly aiming high. And you see that as soon as you take the HTC Titan out of the box. Let's not dress it up here. This phone is BIG - 131.5mm x 70.7mm to be exact. And at 160g, it's certainly no feather. But HTC has packed a lot into the chassis and managed to keep this handset fairly flat, with the Titan sporting a respectable 9.9mm waist. The irony is, it doesn't actually seem that big to us. We came straight from a Samsung Galaxy S2, so didn't really notice the difference massively. In fact, when we put the two phones on top of each other, they appear to be almost the same size. It does, however, feel like a high-quality device thanks to the premium build quality. The screen on the HTC Titan is a lot bigger than previous WP7 devices. At 4.7-inches with a 480 x 800 resolution, not only is it sharp, it takes up most of the front of the device, making it the largest screen on a Windows Phone device. Naturally, it's capacitive (we shudder to think of the days we'd have to poke our i-Mate Jam with a stylus) and colours are vivid and vibrant. Nothing to get too excited about - this is no Samsung Super AMOLED Plus - but it is definitely at the higher end of the smartphone screen graph thanks to Super LCD technology. The actual chassis is one of those unibody jobs that HTC seems to be so obsessed with at the moment. In fact, it took us a good few minutes to figure out just how you take the back off, and had us trying to slide the back rear panel off (a'la Desire HD). In the end, we noticed a tiny button on the very bottom that releases the back, making the phone appear to split in two. You do feel like you're taking the phone apart here, just like you do on the HTC Sensation. Up top, you'll find a standard lock button and headphone jack for 3.5mm cans. The left is pretty unremarkable with nothing but a charging/sync port (micro USB), while the bottom is bare, save for that release button we just mentioned. On the right you'll find a volume rocker, and below it a camera shutter button, which is really nice to see since a lot of manufacturers appear to be leaving these off nowadays. The front holds that massive screen, a 1.3MP self-shooting camera and the obligatory three Windows Phone 7 navigation buttons. HTC has followed the seemingly stupid trend of having the camera lens protrude slightly from the case so that it's the first thing that touches a surface when you put the HTC Titan down on its back. We can't help feeling a little concerned that this lens may scratch easily. The only thing we couldn't find was the microSD slot. Inside or out? Not a sign. HTC hasn't fitted one in line with the spec from Microsoft - although it seems that might change with the launch of the new Nokia phones. The HTC Titan comes with 16GB internal memory, but that's reduced to 12.63GB for users, after the operating system takes its share. And that's your lot. We wish the phone could have a microSD slot, especially when you look at the competition. Because this is the handset that one imagines HTC wants in its armoury against the iPhone 4 and iPhone 4S. It's certainly got no competitor in the WP stable just yet or, at least, not until Samsung gets its act together. In fact, we'd pit it right against the Android-toting HTC Sensation (the one with a memory card slot). To get an HTC Titan for free, you'll need to sign up to a monthly contract of around £31. And at a shade under £500 for a SIM-free model, this isn't a cheap. HTC Titan is not just an adequate name for the form, but also the price.